This year Dam Removal Europe has been successful. In every direction it has grown as dam removals have gained more publicity and the expert network has expanded immensely. This year, more scientific evidence has become available concerning the positive effects of removal and a large number of seminars were held to enhance information exchange. And with this growing attention the team has grown equally. And by building this team we could focus more and more on finding old and abandoned dams and help break them down. Because that is what we love! 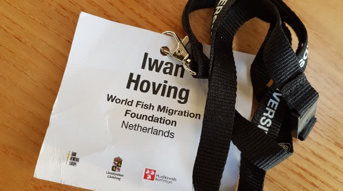 Talking about teams… On World Fish Migration Day 2018, the 21st of April, I was part of a crazy ride—a literal ride. 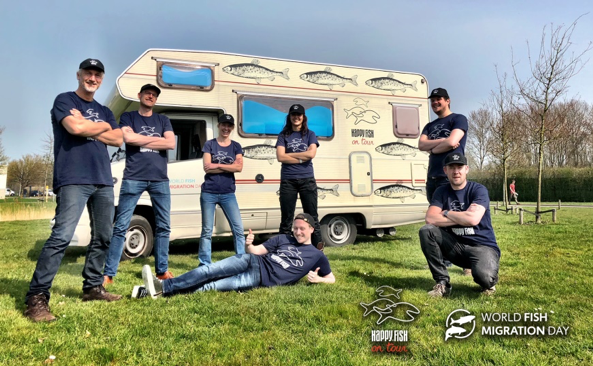 Together with a few colleagues, we embarked on a 5 day road trip in my camper van to visit World Fish Migration Day events in the Netherlands. The happy fish on tour. At the end of the WFMD, Arjan Berkhuysen, Managing Director of the World Fish Migration Foundation, joined us in the beautiful harbour town of Termunterzijl. A piece of a destructed and removed Spanish dam, Yecla de Yeltes, was given to all of us as a gift after his visit at that site. This rock is important to me because it represents teamwork. It is about working together with a bunch of dedicated, enthusiast and very funny people and celebrating achievements. Team spirit. 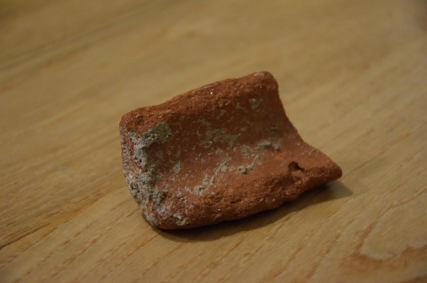 For me, this little stone symbolises a few other important things as well. First, everything built by man can be demolished as we all have seen how a dam can be easily taken down (if not please see this video…it’s pretty dam awesome). I know (I used to be a contractor before I started this job) what it means to demolish old structures before you can start building new things. Easy. Secondly, if you demolish old unused constructions, new situations that come of it will certainly be better and more useful. In the case of a dam removal, nature does the job for you. I just love the fast, positive effect dam removals have on our rivers. By taking out, you gain so much more. Simple. Development, knowledge and experience exchange and network expansion were important components of this past year. 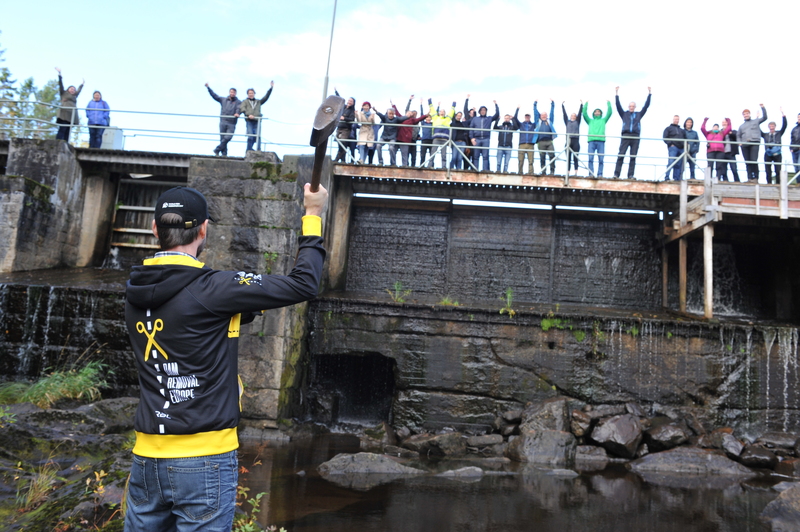 WWF NL started the crowdfunding campaign for dam removal and have already reached their first success with the first dam currently in the process of removal. The people are making it happen! From Sea to Source 2.0 was released…download it for free and have a good look at chapter 7 ;). In the middle of summer, the Policy Report came out which pointed out the astonishing conclusion: “There is almost 1 barrier for each river kilometre in Europe” and at least 30.000 obsolete dams in Europe! So many to choose from…let’s start removing! We had 4 workshops and seminars… And last but not least, lots of fashion and sporty development coming up. Dam Removal Europe clothes will be soon available with the launch of a webshop! So if we are talking about achievements with 2018 nearly over: is it the growing number of dams gone? The removal of big dam like the Spanish dam? The Estonian government and their dam removals in the River Parnu? 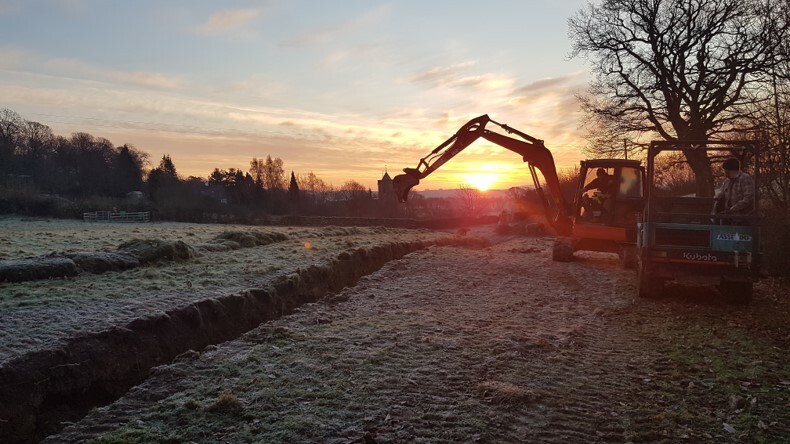 Or is it the preparations of huge dam removals in the near future: the Vezin Dam, the biggest dam removal in Europe; the Vaanta Dam removal in Finland; and a big culvert will be removed in the River Ribble (UK). All starting in spring 2019. Exciting times! Have a free and flowing 2019 full of love and enjoy!